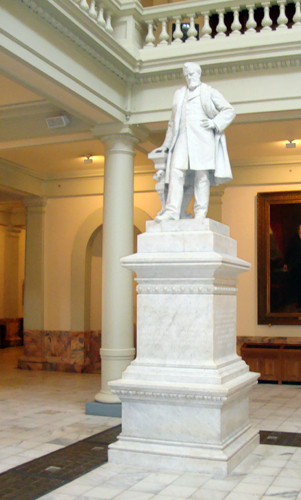 Benjamin Harvey Hill, depicted in a marble stautue that today resides on the main floor of the Georgia Capitol Building, was actively involved in Georgia politics for three decades with his final title being U.S. Senator for the State of Georgia. Confederate President, Jefferson Davis, was in Atlanta on this day in 1886 at the behest of Henry Grady, Managing Editor of the Atlanta Constitution, on a trip to speak at the dedication of the Benjamin Hill statue. Davis is one of the three Confederate leaders depicted horseback on Stone Mountain.